Analysis: This investment is largely predicated upon my belief that bettors should always look for ways in which to side with the sportsbook’s perceived error. San Diego presents an excellent opportunity to invoke that general rule as the Padres have lost nine consecutive games (and 11 of 13), yet Vegas has installed them as moderate home favorites against Colorado. What is even more shocking is Edinson Volquez’s vomit-inducing career numbers against the Rockies: 3-5 with a 7.03 ERA and 1.91 WHIP. Indeed, Volquez has faced Colorado three times this season over which time he has yielded a combined nineteen earned runs on 26 hits and six walks in 11.7 innings of work! The situational analysis also appears to favor Colorado has the Padres just dropped their ninth straight loss at Washington and now have to travel across three time zones to play tonight without rest. But, if it looks too good to be true, it usually is and Vegas has installed San Diego has favorites for a reason. It is our job to find those reasons so that we have empirical evidence to side with the perceived oddsmaker error. Colorado arrives in town with a scuffling offense that is batting .250 with a .304 on base percentage on the road (3.9 runs per game) and .206 with a .267 on base percentage over its last seven contests (3.0 runs per game). In addition, Colorado right-hander Tyler Chatwood is a prime regression candidate has his peripheral statistics are not supported by his pedestrian skill set. Chatwood also takes the mound in poor form as he allowed six runs on 11 hits in a 10-8 loss to the Dodgers in his last outing. San Diego has already enjoyed success against Chatwood as the Padres tagged the youngster for four runs on five in in just 3.7 innings last September. Let’s also note that Colorado’s bullpen has completely imploded with a 6.83 ERA and 1.65 WHIP over the last ten days, including allowing 22 earned runs on 39 hits (6 home runs) in 29 innings. In contrast, San Diego’s bullpen boasts a solid 3.35 ERA and 1.23 WHIP in 2013, including a 2.76 ERA and 1.11 WHIP at home and a 2.52 ERA and 1.12 WHIP at night. It is also important to note that Volquez enters tonight’s game in good form with a 2.55 ERA over his last three starts. Volquez is also 2-1 with a 2.73 ERA in five starts since his worst outing of the season on June 7 (a 10-9 loss at Colorado). San Diego also appears to have caught a fortuitous break in that Colorado will be without All-Star shortstop Troy Tulowitzki and outfielder Dexter Fowler, both of whom are on the disabled list. Another Colorado All-Star, Carlos Gonzalez, had to leave yesterday’s game at Arizona because of a sprained right middle finger. 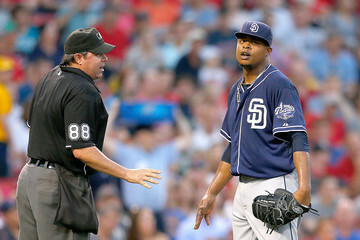 From a technical standpoint, Volquez is a profitable 23-9 (+17.1 units) off two or more consecutive losses and 18-9 (+10.4 units) in competitively-priced games, whereas the Rockies are a money-burning 77-146 (-39.7 units) as underdogs, 66-147 (-65.6 units) in July and 38-60 (-24.0 units) in competitively-priced games. Take San Diego and invest with confidence.